Unwind brings you the lowest prices allowed by the manufacturer on all Stressless office chairs. Are you still trying to decide? Select your preferred leather grade, match the upholstery and wood colors, and top it all off with an amazing accessory. Enjoy Fast, Worry-free Delivery on a Stressless Magic Ergonomic Office Chair. It's a great time of year to purchase from the amazingly comfortable, Stressless Magic Office Chair line! This popular, modern recliner delivers exquisite head, neck and back support and the over-stuffed smooth, soft, cushioning allows you to sit undeterred for many hours on end. The Stressless Magic Office Chair is among the most modern and comfortable of the Stressless recliners available. We ship fast. We can ship virtually anywhere and typically your items ship assembled and ready to enjoy. All you have to do is sit down and relax. We provide multiple levels of delivery to ensure there is an option to suit your needs. Ask us about Expedited Shipping Opportunities or our White Glove Services. Click here to learn more about Ekornes and here to learn more about The Unwind Company. Stressless by Ekornes Magic Office Chairs are made in Norway. They are the only brand office furniture in the world to be endorsed by the American Chiropractic Association. This is the largest Chiropractic Association in America. It is based in Alexandria, Virginia and serves as the national voice for the profession. The endorsement was officially announced early in 2002 but we wanted to take a moment and remind you that when you choose a brand-new Medium Stressless Magic Office Chair, you are not only choosing style. You are choosing a back-healthy seating solution. The patented comfort technologies found in Stressless Brand Recliners is identical to the technology inside the Office Chairs. They ensure correct and positive support for your head and lower back in any seating position. It’s one of the many reasons why these chairs are so much more comfortable than any other brand in the world. Plus System- This tech allows the headrest of your new Magic Medium Sized Office Chair to come forwards slightly as you recline in your seat. This allows you to easily carry on conversation, maintain eye contact with your computer or workstation or even enjoy a quick snack. Stressless Office Chairs & Recliners arrive fully-assembled with Full Manufacturer's Warranty and our Money Back Guarantee. Choose Nationwide In-Home/Office White-Glove Delivery - Select White-Glove Delivery when you order your back-saving Stressless Office chair from Unwind.com and we'll bring your chair inside and even set it up (we'll also take the packaging when we leave). 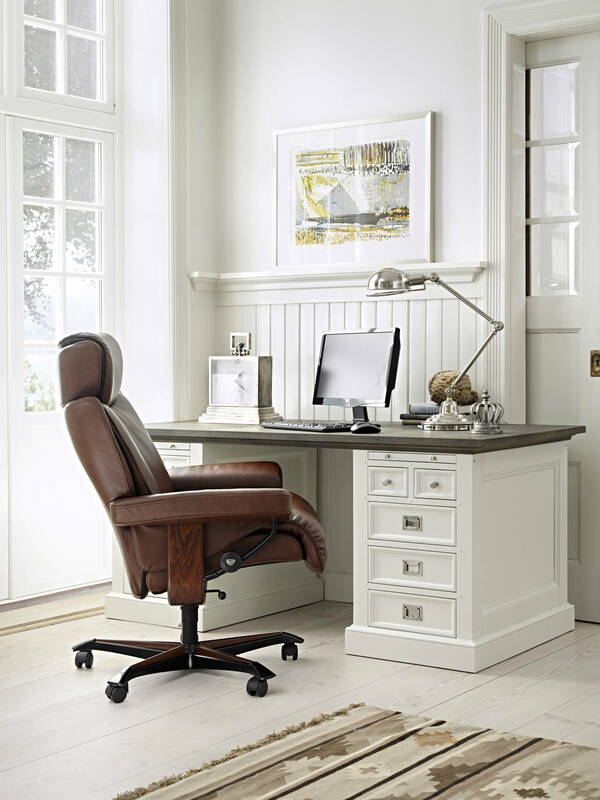 The Magic Office Chair is one of the premier models available in the Stressless Office Lineup. This model features wide shoulder support, an adjusting headrest, thick pads on top of the chair, and a wide angle to the armrests which allows you to feel open and relaxed. The seat contains all of the Comfort Technologies we know and love and comes backed by the Manufacturer's guarantee that these will last nearly forever. We also are so confident in Ekornes Furniture and Stressless Office Chairs that we offer our own Satisfaction Guarantee. Take advantage of our Fast, Pain-Free Shipping to nearly anywhere in North America. Your item will arrive Brand-New, Fully-Assembled, and covered by the Full Manufacturer's Warranty. You will also have the support of an assigned team member who will be available to you to answer any and all questions. Ekornes uses only the finest hides for their premium leather upholstery. We recommend that you apply a leather conditioner to this hide at least 1-2x annually. This will continue to protect your leather from surface stains and mild environmental stressors. It will also keep the hide moisturized and prevent cracking as the leather ages. We recommed the Hide Bracer Leather Conditioner. It was originally made by Ekornes. It is guaranteed to provide the proper maintenance and care your leather needs. In the rare event that you needed to clean up a mess or something else, Ekornes provides Leather Care Kits in 2 Sizes: The Small 100ml and The Large 250ml kit. These include 2 bottles of a proprietary solution. The first cleans and removes surface debris while the second nourishes and coats the leather. It is certainly a great time of year to purchase an amazingly comfortable, ergonomic Stressless Magic office chair! This popular office chair delivers exquisite head, neck and back support and the over-stuffed smooth, soft, cushioning allows you to sit undeterred for many hours on end. The Magic recliner/office chair line is among the best-selling Stressless recliners at The Unwind Company. Want to add a matching Stressless Sofa, Loveseat or Sectional? You’re in luck as there are Ekornes Batick & Paloma Specials for the Stressless Legend Sofa Series. This promotion will save you $1000’s. Simply choose a matching Batick or Paloma leather sofa or sectional model and watch the savings stack up! Please call 1-888-486-9463, click to Live Chat, or email stressless@unwind.com to connect with a Stressless Office Chair Specialist. The seams and designs are intentional efforts to enhance each person's comfort level and allow unique styles of seating. These divisions or seams divide the seat itself into "Comfort Zones". This allows each person to find that seat that supports their back and body in just the right place. The incredibly strong steel frame and flexo springs are concealed within multiple layers of foam. This allows you to literally sink into your chair. The continually adjusting Plus System provides a specific type of continual support that has earned this brand an exclusive endorsement from the American Chiropractors' Association. The patented Glide System allows you to seamlessly sit, work, recline, and relax without using any levers. The technology uses your body weight to provide any motion needed to transition. It's flawless. 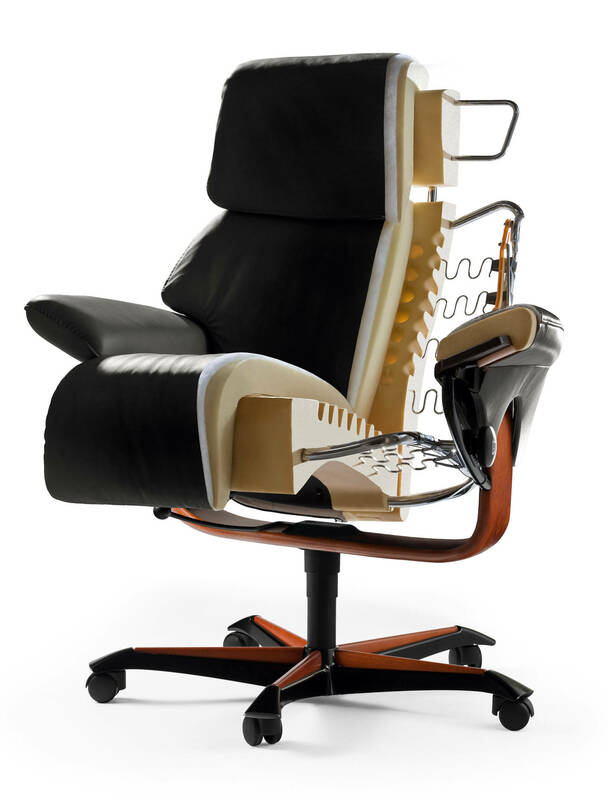 The Office Chairs even feature a "Gas Lift" Lever that allows you to raise or lower the height of your seat. This means no matter your desk or workstation, your chair should fit comfortably. It Looks Like a Stressless. It Feels Like a Stressless- It's total comfort on wheels. 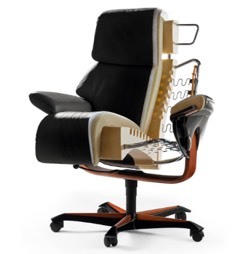 Welcome to Stressless Magic Office Chair by Ekornes- In Stock Now! Learn about White Glove or Inside Residential Delivery at Unwind.com. Every Stressless has a relaxing story to tell, beginning and ending with the word "comfort." It has been the driving inspiration of Ekornes of Norway for the last 40 years. So, the entire time Ekornes has been making the world's finest back-care and total-body comfort recliners, they have also been thinking and researching the whole concept of true body comfort. It also means that every single detail in a Stressless is there for a reason. The sole purpose of Stressless by Ekornes is to make you as comfortable as possible. Now, they have taken this ultimate comfort a step further, so that you can enjoy real Stressless comfort even while you are working at home or office. 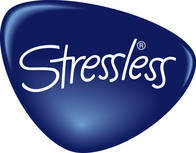 Stressless is a trademark of Ekornes, in the beautiful country of Norway. The Unwind Company, Unwind.com and our network of relaxation and backcare sites & stores, are factory-authorized, nationwide in-home providers of Back-Saving Stressless Recliners, Ekornes Sofa's, Stressless furniture and Accessories. Stressless Magic Office Chairs arrive fully-assembled with Full Manufacturer's Warranty and our own 30-day Money Back Guarantee. Choose Free Nationwide In-Home/office White-Glove Delivery- Select White-Glove Delivery when you order your back-saving Stressless Office chair from Unwind.com and we'll bring your chair inside and even set it up (we'll even take the packaging when we leave). It's no wonder Ekornes Stressless Office Seating earned endorsment from the American Chiropractic Association. Ekornes Stressles Magic Office Chair Dimensions: W: 32.5" H: 43.75" - 49.5" D: 30.25" Seat Height: 18.75" - 21.5"
I love the reclining action and how it automatically adjusts the back support. It really helps my lower back not get tired/sore after sitting down for a long time in front of the computer.